Battlecry: Deal 4 damage to a random enemy minion. 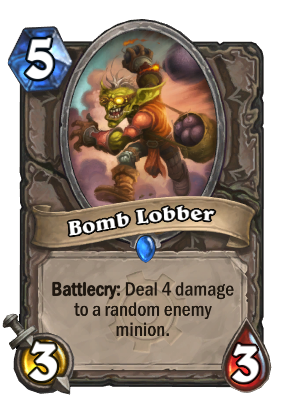 He lobbies Orgrimmar daily on behalf of bombs. stop giving people cancer! dammit! But what do you think about golden animation? Do you like golden animation? If you're playing your cards right, this won't be random. Would have been insane if this card was released with Naxx. I still love the value this card brings. It is a useful card against most constructed decks, but call me greedy, I wish it was a 3/4 instead of a 3/3. It still may deserve a slot in a few decks though, but a 3/3 is a weak body now. I guess Spider Tank + Flamecannon would have been too good for a neutral card though. A shame, because a 3/3 is 2 mana overcasted, and on some board states, it will be problematic. Good card though nonetheless. In my experience, this is an insane tempo card in arena. Another strong target for the Recombobulator. This card is so good for taking out annoying turn 5 drops like Gadgetzan Auctioneer and Azure Drake. It's also good for zoo counters. Great counter to Miracle rogue, in most cases at turn 5 or turn 6 there will be a Gadgetzan Auctioneer from opponent with conceal on the board, if we play this card, 100% will remove it. His stats aren't really promising, but the hability is something to take care about. And all in just one card draw.